Dust explosions are fortunately rare, but also devastating. To guard against them, it is important to fully understand the chemical reactions behind them. Fires and explosions in industrial processes can be devastating, with incidents often resulting in injury or death to persons at the premises or in the vicinity. They can also have a long-term effects. While the causes and prevention methods for fires in the work place have been researched extensively, the potential for explosions and dust explosions is often overlooked by many companies. However, when they occur, the impact can be catastrophic. The industries that have historically had the high frequency of dust explosions are paper and wood processing, followed closely by metalwork operations, as this is mainly where the metal exists in powdered form. The most recent HSE analysis from 1989, which covers the period 1979-1988, suggests that the UK saw 303 dust explosions in that time, or around 30 a year. A 2001 paper for the Institution of Chemical Engineers suggests that, Europe-wide, there is approximately one dust explosion per day. The industries most affected are those where the most common explosive materials are found: these are wood or paper products followed by metals, food products and pharmaceuticals. 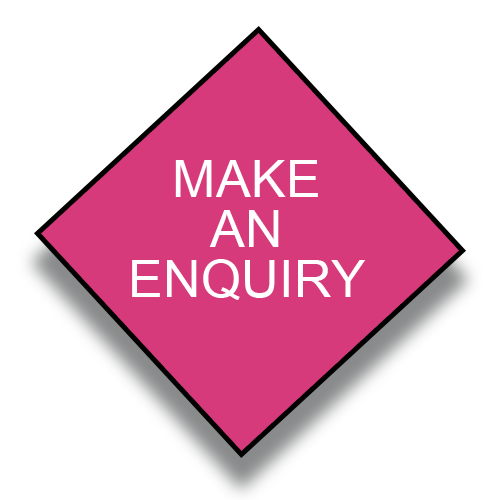 The results of investigations often list the cause of ignition as “unknown”, which may mean there is a lack of understanding of how the explosions are caused, and the effect of a lack of control of heat or ignition sources. The 1989 HSE study, by John Barton, found that paper and wood mills accounted for 25% of cases followed by metalwork’s (18%), food product businesses (14%), the pharmaceutical sector (9%) and facilities for grains and cereals. Meanwhile, a 2006 study of combustible dust explosions by the US Chemical Safety and Hazard Investigation board reported that between 1980 and 2005, 281 explosions occurred, killing 119 workers and injuring 718. This study showed that, in the US, food production is the most common cause of explosions at 24%, with wood products second at 15% and chemical manufacturing third at 12%. To understand how dust explosions occur, we need an understanding of how fires occur. 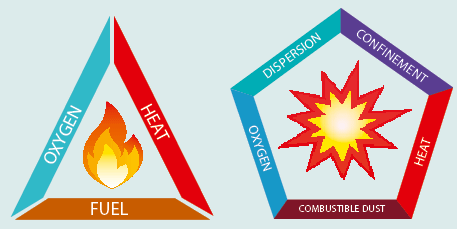 The “fire triangle” is a useful reminder that the chemical reaction which must occur to create a fire features three elements- fuel, heat and oxygen. Heat must be applied to the combustible substance in the presence of oxygen for ignition to occur. When the materials that are being heated are large and compressed, or soil, it can take a large amount of heat to cause the combustible substance to reach a temperature where it starts to give off flammable vapour or gas. This is often called the “flash point” for flammable liquids but the same concept applies similarly to solid objects, eg. Coal or wood. This term is used to describe the temperature at which the flammable vapour or gas given off by the heated material ignites. The fire is the chemical reaction that takes place in the vapour above the liquid or object. As the size of the object gets smaller, proportionately less heat is required for it to reach the trigger temperature. Consider a block of wood: a larger amount of heat would need to be applied to start a fire when it is in this form, compared to the same block of wood reduced to sawdust or even powdered form. This is because each individual particle of wood has a larger surface area compared to its volume. Therefore it takes less time for the flash point to be reached when heat is applied. The larger surface area absorbs heat more quickly subsequently emitting heat more readily when burning. If there are many wood particles then, as each heat’s up and burns, it gives out heat to neighbouring particles which in turn heat and burn, effecting a chain reaction. If the particles are laid out in a long strip a linear burn is created, much like the gunpowder fuses seen in old black and white movies. However if the particles are close together in a spherical form, e.g. a cloud, then the chain reaction is swift and in all directions, causing pressure build up and an explosion. The fire triangle model does not fully explain the importance of the form of fuel in dust explosions. The fuel element of the triangle can be split into three to take account of this forming what is known as the dust explosion pentagon. Understanding how the fire triangle develops into the explosion pentagon helps to identify some of the causative factors, so that controls can be put in place. Oxygen remains an essential component, though it should be noted that an increase in oxygen can make a fire fiercer. It can also make explosions more violent by providing enough oxygen to fully combust all the material. Compared to the “fire triangle”, the role of the heat element in the pentagon is slightly more complex. As there is a specific size of particle to ignite, there is a minimum level of energy needed to create enough heat for ignition. This constraint is rather theoretical; however, as the actual heat source available is often well above the required temperature; for example a hot surface, local fire or electric flashover. An important fact to note, though, it is that the ignition source required for a vapour explosion may be much lower energy (e.g. temperature) than that for a dust explosion. In the dust explosion pentagon, the fuel element is in effect expanded to become points three, four and five of the pentagon; namely, combustible dust, dispersion density and confinement. The first requirement is that the dust is combustable, and in the right dispersion and density for the heat generated by one burning particle to ignite nearby particles and hence causes a chain reaction. In practice, this means a thick dense fog, as a slight dust cloud is very unlikely to be ignitable. In numerical terms the lowest exposable limits are typically in the range of 10-50 grams per m³, according to HSG103-Safe handling of combustible dusts, the HSE publication. This is between 2000 and 10,000 times greater than the Workplace exposure limit (WEL) for hardwood dust. Levels of this nature are generally found within an enclosed area, except in the event of a major plant failing. The fifth point of the explosion pentagon is the confinement of the dust cloud. This can occur inside ventilation equipment of local exhaust ventilation (LEV) systems, and makes an explosion more likely. The intensity of the explosion will also be increased because the pressure rise is constrained, and the rate of the ruse is increased when confinement occurs. This can result in more significant damage. The Dangerous Substances and Explosive Atmosphere regulations (DSEAR) were introduced in 2002 to supplement the underpinning Health and Safety at Work Act. As with most modern regulations, these require an assessment to be made where an explosive atmosphere might be present. A DSEAR assessment should take into account the five elements of the explosion pentagon. By conducting a DSEAR assessment to establish and implement proper controls, the risk from dust explosions can be substantially reduced.